Knit 'nd Go: Shawl in red. There were two needles matching together. They made all beautiful little things for the tiny one's. All made with two hands and a lots of love. 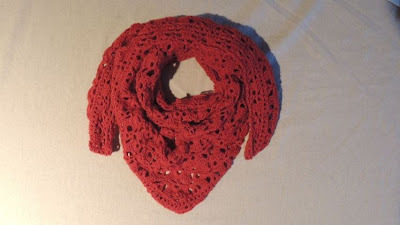 Ik maakte deze shawl ook nog eens, maar dan in het rood. Ik haakte er ook een ander randje aan, gewoon omdat het eens iets anders is. I made this shawl again, but now in red. I crochet also another edging, just because it's something new. Volg Fille Unique op Facebook! Stripes whith gray and white. Give Away bij Fille Unique! Thema Vensterfoto. Thema-afbeeldingen van hdoddema. Mogelijk gemaakt door Blogger.